We have been very busy here in St. Aidan’s over the past few weeks preparing for Saint Patrick’s Day. The band have been practising every morning and we have lots of work done on our float. We look forward to your support at the parade. 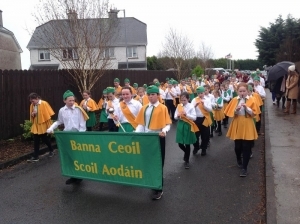 On Thursday 16th March Banna Ceoil Naomh Aodáin, along with the majorettes came out to welcome The Quaker City String Band and friends from Philadelphia, who had just arrived in Kiltimagh for the Saint Patrick’s Day festival. Unfortunately, the rain prevented us from marching in the town but we did give our American friends a warm welcome in the school hall! Click here to see video clip of school band. Click here to see video clip of band and majorettes.